In order to keep creating, we need to seek out new life experiences that inspire us, make our energy levels go up, get us excited about something even if it is unrelated to our own creativity. It is called filling the well of inspiration. This past month, I went on a walking tour of the public art in our home town organized, researched and led by Dylan Zavagno who works at our local library. He did so much research and found out the most amazing things about this public art that I have driven by for decades. It felt so very different seeing the sculptures and paintings up close from all different angles while hearing the stories about the artist, their style of art, and how our village ended up with their art. Dylan touched on all the things that make me love art history; the sometimes quirky stories and the reason behind why the artist makes art. In other words, what motivated these artists to make art and what are they trying to say with their art. Our home town is lucky in that we had some wealthy captains of industry who lived or had a business here. First up, a Tennessee pink marble sculpture resides in the fiction section in our library. 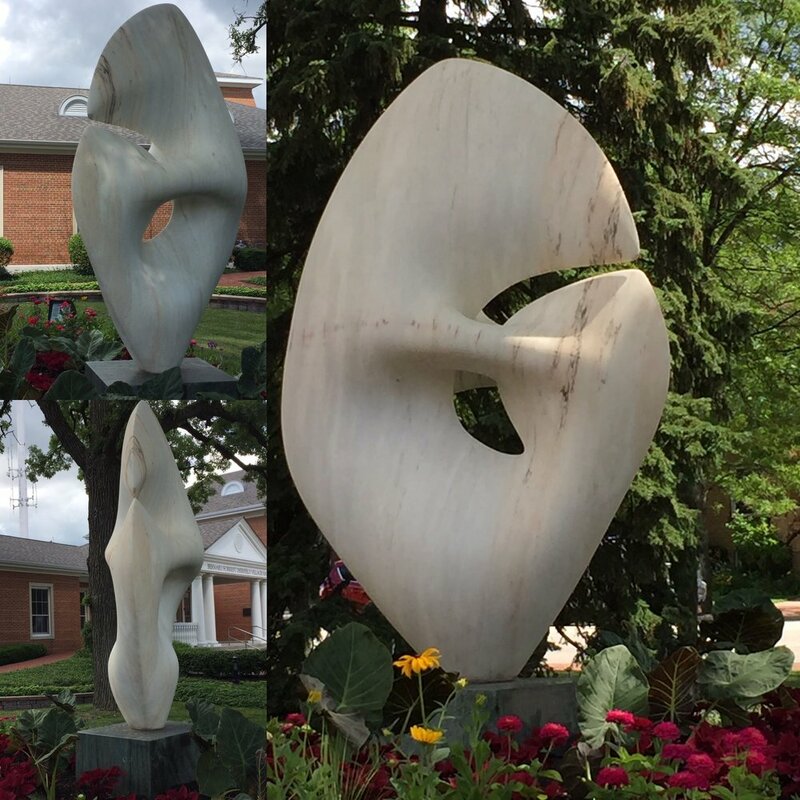 The Turner family descendants donated a sculpture called Energy Form, 1980 from their parents' collection. The former CEO of McDonald's Fred Turner had a friendship with the artist Robert Winslow who made a large scale sculpture for McDonald's headquarters. The small sculpture is from the same stone as the larger. Right around the corner in the library is a cubist painting Nature Morte, 1953 by Picasso's nephew, Javier Vilató. This painting was donated by Nathan Cummings who owned a local business you may have heard of, Sara Lee Corporation. Cummings was an avid art collector who bought what he liked and shared his art as gifts to family and friends. Our library was one of those beneficiaries. He did not fit the stereotypical art collector and befriended many of the artists, Picasso being one of them. When the plant left our town, Sara Lee left behind 3 abstract sculptures by Antoine Poncet and they are my favorites. He was the only pupil of the famous artist Hans Arp. They are all made of Carrara marble and look absolutely different from different angles. I have included images of all three sculptures from different angles. As much as I am all about linear forms in my art, I love the smooth organic curves of his sculptures. Cummings was Poncet's friend, patron and supported him to do a series of 18 sculptures using Carrara marble in the 1960s. We are lucky to have three of them in front of our library and Village Hall. I am fascinated by Cummings. One interesting thing I read about Cummings is that he had 15 fishing boats in his fleet and each one had one of his paintings on board. Cummings believed art should be accessible to all, the democratization of art for the enjoyment of all, not just the cultural elite. The Public Art tour was fantastic. I am so grateful for all of Dylan's efforts. These stories had been lost and he brought this knowledge back to our community so we can appreciate what we have. (There were other artworks in the tour but I included my favorites in this article.) Later this summer, Dylan is adding audio of the interviews he has had with some of the artists. I am so looking forward to hearing more about their creative processes. You never know what you may learn and what may trigger a new inspiration about how you may want to approach a certain piece you have struggled with or a new way of approaching your creative routines or what your art means to you. It helps to get out of your own head and take a visit into someone else's for a change.